Lynn Jeffs and her husband Alan are long-time friends of cbm and they’ve both chosen to leave a Legacy gift in their Will. 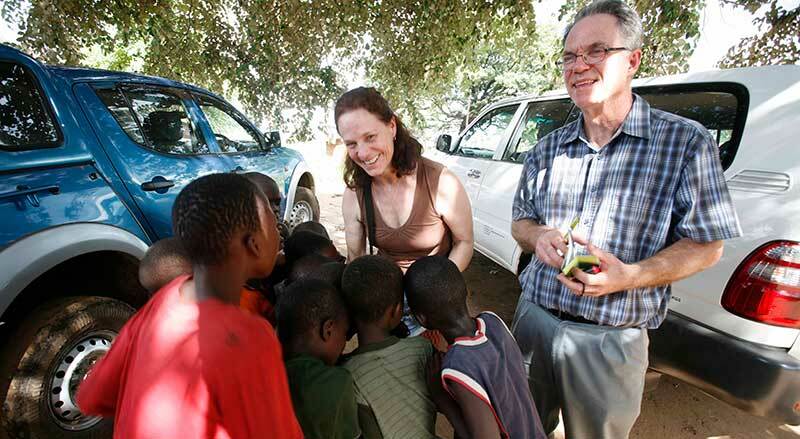 After visiting cbm’s work in Swaziland and Malawi, Lynn explains how much impact a Legacy gift can make. Our truck bumped and bounced over the rocky, dirt roads through remote Swaziland. My husband and I sat in the backseat while Jono (short for Dr. Jonathan Pons) drove. It was Jono’s day off – if you really want to call this a day off – and we were on our way to deliver eye drops to a man who’d received surgery a few weeks before. Jono is the ophthalmologist at cbm’s partner medical centre – Good Shepherd Eye Hospital. He’d restored the man’s vision, but in order to keep the infection from coming back, the man needed to have a special type of eye drops. Typically a patient would just come back to the hospital if they needed medication, but Jono knew this man couldn’t afford a second trip to the hospital. So we made the hour-long trip to find this man and deliver his drops. 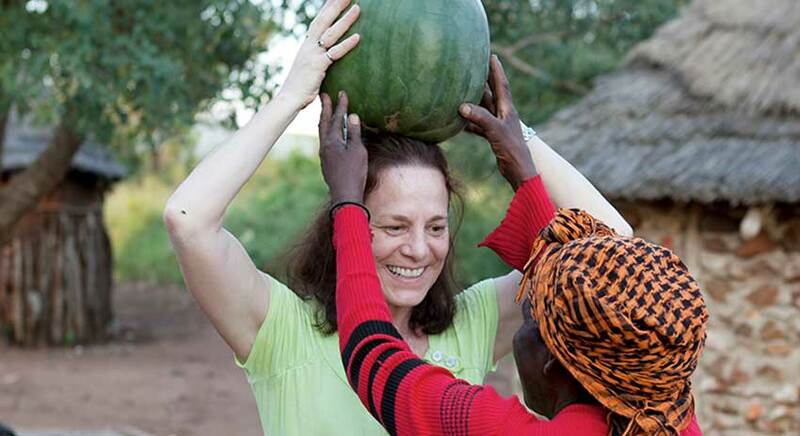 When we arrived at the man’s home, we squeezed our way through rows of trees that surrounded the compound. 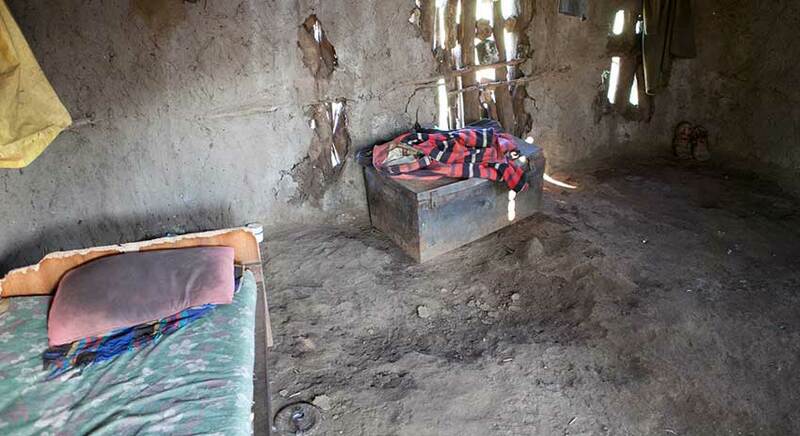 His family lived in a series of dung huts. They had clothes hung on the walls, bare floors, one small bed. The family’s kitchen was a fire pit under a large cactus tree. And a handful of chickens pecked around outside. It was one of the poorest sights I’d ever seen. We dropped off the eye medicine and some groceries that we’d picked up as a gift. The family was incredibly thankful and very hospitable to us. But the extent of their poverty was shocking, and it was just the start of what we were about to see. On our way back to the hospital, we stopped and met an older woman waiting at a bus stop and offered her a ride into town. We learned that she was taking care of all her grandkids, because all of her own children had died of AIDs. This is common throughout Swaziland. It’s almost like an entire generation has been wiped out by the disease. We hardly saw anyone between ages 25-40. They are all gone. The children are either orphaned or in the care of a grandparent. And this is why Jono’s work is so important. 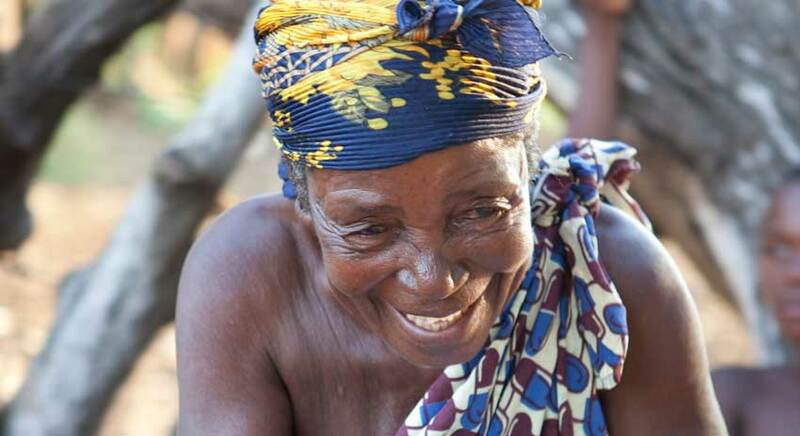 If a grandmother loses her sight, there’s no one left to look after her grandchildren. And the children fall even deeper into poverty. At the hospital, Jono showed us through his eye centre and all of his equipment. It was a very well-run facility – clean rooms, quality equipment, and an extremely caring and loving staff. Jono works to serve both his patients’ physical and spiritual needs, praying with them, talking to them, seeing them as people rather than numbers. His commitment is exceptional. But despite all the wonderful work going on at the Good Shepherd Eye Hospital, the centre is facing one major problem. Everything is dependent on Jono. If anything happens to him, Swaziland would be completely without an eye doctor. There is no one else capable of taking his place. That is why what Jono showed us next is so important. It is a teaching microscope – a new addition to the hospital paid for by a Canadian cbm donor. The microscope allows Jono to perform eye surgery while teaching a student at the same time. I’m observing Dr. Pons perform cataract surgery. Jono is already training two local medical students to perform cataract surgeries and other procedures. 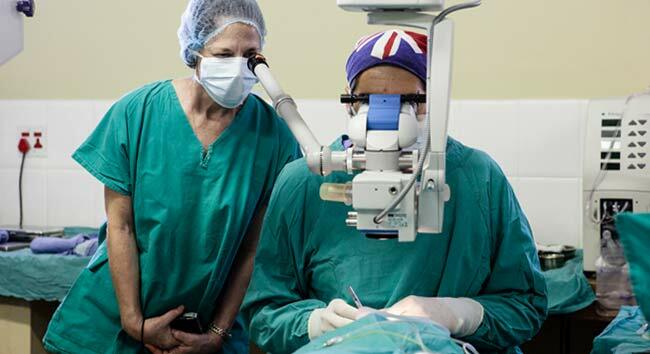 This will help him build a full team of cataract surgeons to serve the people of Swaziland. That’s the beauty of training national Swazi staff . Even if Jono ever has to leave the country, he’ll leave behind trained professionals who can treat people for years to come. 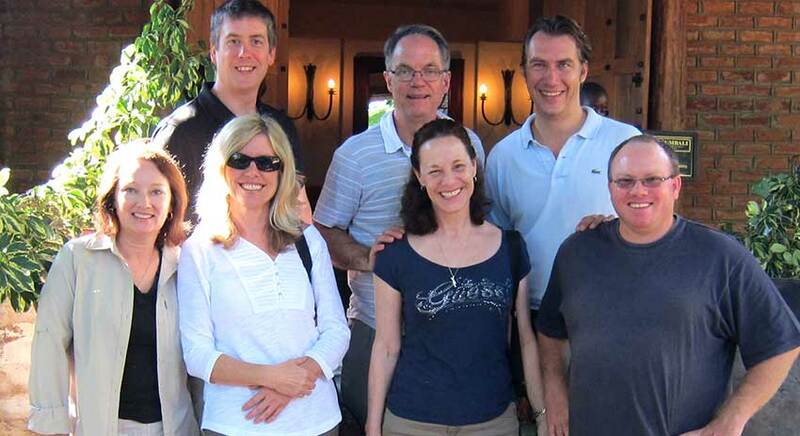 You can make a gift to cbm that will help Jono train these national doctors. And, then these doctors will train other doctors – giving sight for generations. That’s the power of leaving a gift in your Will. It’s called a legacy gift, because it’s your legacy. It’s the gift that continues to live out your values and makes an impact for years and years after you’re gone. And that gift could train new doctors. Or it could buy new hospital equipment, an ambulance, or a whole new hospital. There are so many possibilities. I know when my husband and I decided to include legacy gifts in our Wills, we talked with staff at cbm to discuss how our gifts will be used. They were eager to hear our thoughts. And when they receive our gifts after we pass away, they’ll keep our wishes in mind when designating the funds. Whatever passion it is that the Lord has laid on your heart, I invite you to consider leaving a legacy gift in your Will. It’s a chance to leave a lasting gift that will bring miracles to the lives of people not just in Swaziland, but all around the world. And what an incredible blessing you’ll be as your legacy lives on. UPDATE: The Good News just keeps rolling in! Since Alan and Lynn’s last visit, Dr. Jono is training even more medical staff at the Good Shepherd Eye clinic. In addition, cbm is partnering with The Luke Commission, a mobile outreach medical clinic that brings eye surgeries and health services to people living in the remote areas of Swaziland. These two clinics are on track to reach the goal to eliminate preventable blindness in Swaziland by 2020. A big thank you to all our supporters! 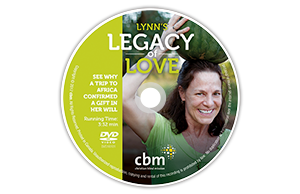 Watch a preview now of “Lynn’s Legacy of Love” DVD.